We design, manufacture and install kitchen cabinets in San Jose, California. by making the best plan for their needs and budget. 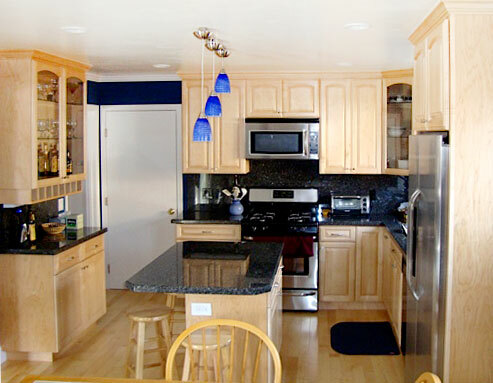 Cabinets Bay Area focuses primarily on kitchen cabinets in San Jose and the surrounding Bay Area. While we offer our specialized refacing technique, as well as refinishing, we also offer custom and semi-custom cabinets. Our local cabinet makers and craftsmen have been working in San Jose for over 30 years creating unique and exclusive cabinet designs for our clients. We seek to provide functional as well as sophisticated designs to fit both your style and budget. Cabinets Bay Area has been a huge part of the kitchen cabinet industry in San Jose and with our new focus on ecological sustainability we hope to be leaders in changing the attitudes and mores in the remodeling and construction industry. San Jose residence had upgraded their appeal with natural kitchen cabinets, manufactured and installed by Cabinest Bay Area.